Authorities attack artists and audiences with water cannon. Photo: Vladimir Sichov (courtesy of Igor Shelkovsky). Destroyed works by Lydia Masterkova and others. Photo: Igor Palmin (courtesy of Igor Palmin). Artists set up. Lydia Masterkova, center. Photo: Igor Palmin (courtesy of Igor Palmin). Artists and public. Photo: Igor Palmin (courtesy of Igor Palmin). Invitation to the First Fall Outdoor Exhibition of Paintings (courtesy of Vitaly Komar). The Bulldozer and Izmailovsky Park exhibitions were pivotal episodes in the history of unofficial Soviet art. A small group of artists, led by painter Oskar Rabin and poet and collector of underground art, Aleksandr Glezer, attempted to stage the First Fall Outdoor Exhibition of Paintings on an empty site on the outskirts of Moscow. 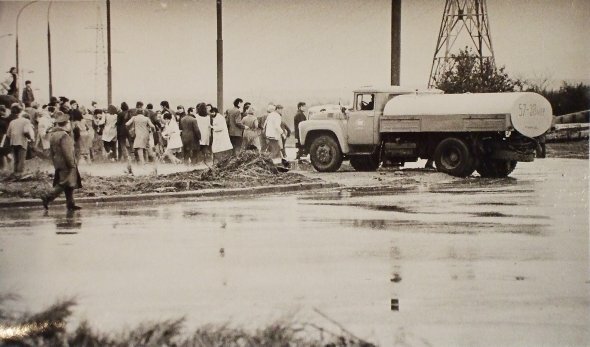 Several participants were detained on the way to the show, and the rest were met by militia with dump trucks, bulldozers, and “volunteer workers” who announced that they were building a park on the site. 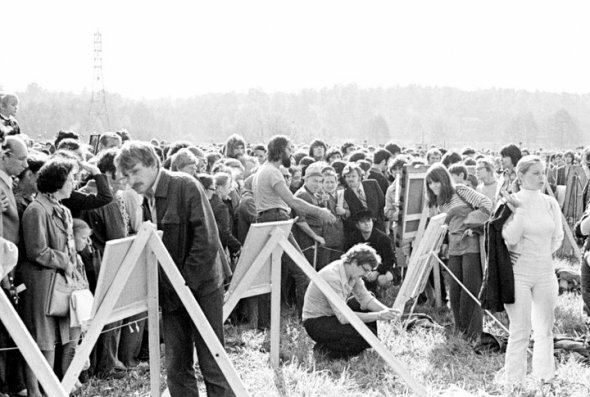 The spectators–around 400 artists, local residents, as well as Western journalists and diplomats–were asked to leave, and the scene turned violent when the “workers” charged at the artists, knocking their works to the ground to be destroyed. 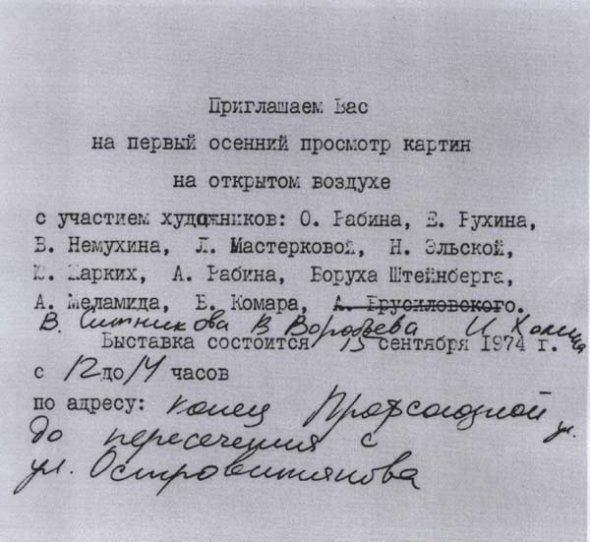 Several foreign journalists were beaten; police arrested Oskar and Aleksandr Rabin, Rukhin, Elskaia, and Tupitsyn; and twelve spectators were taken for interrogations. While the Soviet press called the show a “provocation” intended to harbor anti-Soviet sentiment, front-page coverage in the foreign press highlighting the violence and objections from the US embassy in Moscow put pressure on the Moscow authorities to ease their stance. 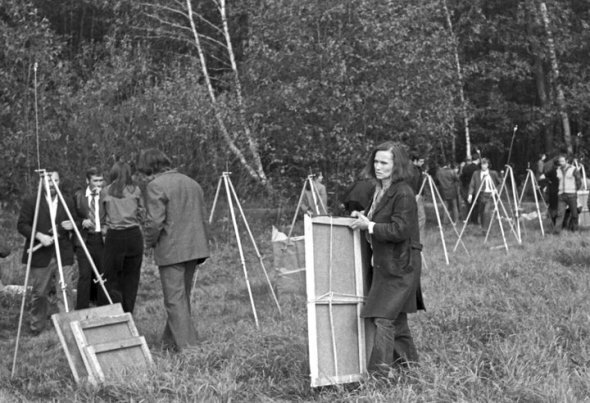 As a result, the Second Fall Outdoor Exhibition of Paintings was allowed to take place two weeks later on 29 September 1974 in Izmailovsky Park, for which the show takes its more common name. 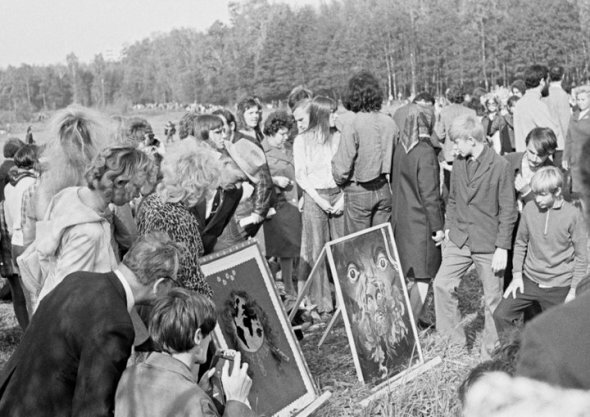 It lasted for four hours, was seen by hundreds of spectators, and was the first uninterrupted public display of unofficial art in the Soviet Union, albeit not without repercussions. Many of the original participants of the Bulldozer show were persecuted or exiled, and several died under mysterious circumstances. 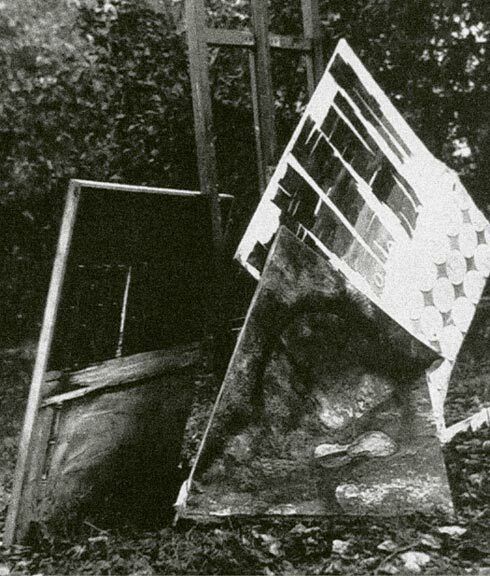 Exhibitions of unofficial art began to be mounted through the new Painting Section of the Graphic Arts Union, which was soon established as a means to bring nonconformist art under the management of the official art bureaucracy.